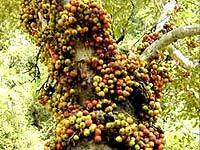 Habitat : It is cultivated all over india and also grows wild in many forests and hills. Uses : According to ayurveda, roots are useful in hydrophobia whereas bark is acrid, cooling, galactagogue and good for gynaecological disorders. Fruits are astringent to bowels, styptic, tonic and useful in the treatment of leucorrhoea, blood disorders, burning sensation, fatigue, urinary discharges, leprosy, menorrhagia, epistaxis and intestinal worms. According to unani system of medicine, leaves are astringent to bowels and good in case of bronchitis whereas fruits are useful in treatment of dry cough, loss of voice, diseases of kidney and spleen. Bark is useful in asthma and piles. Latex is applied externally on chronic infected wounds to alleviate edema, pain and to promote the healing. The tender leaf buds are applied on the skin, in the form of paste, to improve the complexion.